We had snow showers throughout the day yesterday (some freezing drizzle mixed in at times) and a few last night. It added up to around another inch so our two day total was an inch and a half. I headed out for a ride hitting some St. Germain, Eagle River, Sayner, Arbor Vitae/Woodruff and Lake Tomahawk trails. 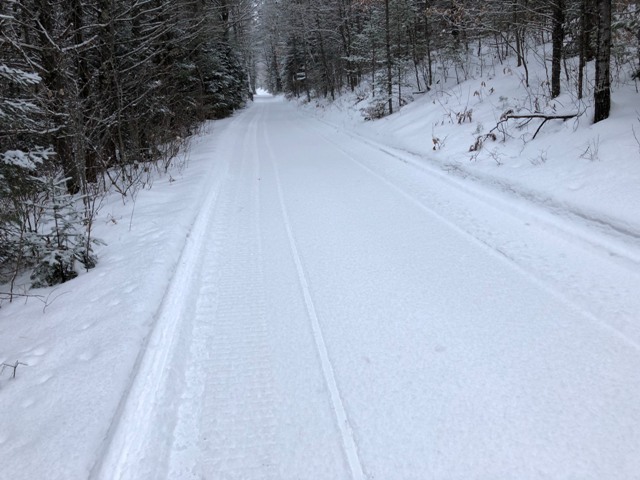 The St. Germain, Eagle River and Lake Tomahawk trails I rode were groomed. 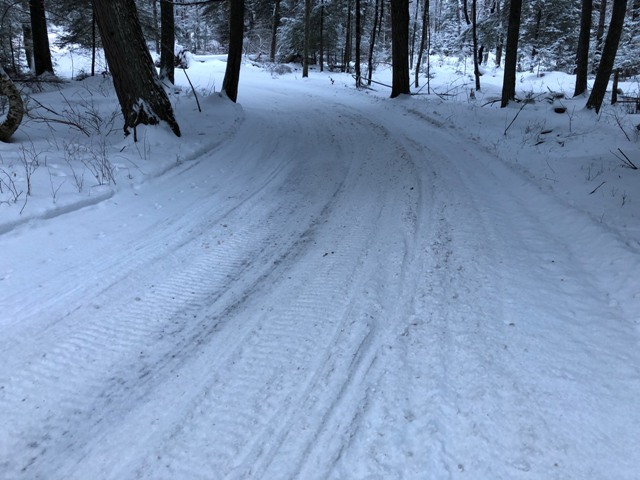 Sayner had groomed most of their trails I rode. The Arbor Vitae/Woodruff ones I rode looked like they had been groomed the day before. Trails were pretty smooth today. They did have a softer feel to them with the new snow. I’m keeping the trails as an overall fair/good rating. You’ll see everything from a few poor spots up to some excellent areas, but most will fall into the fair or good categories. One area to watch out for is icy corners. There are a lot of them out there – even with sharp carbides, I was pushing through some. 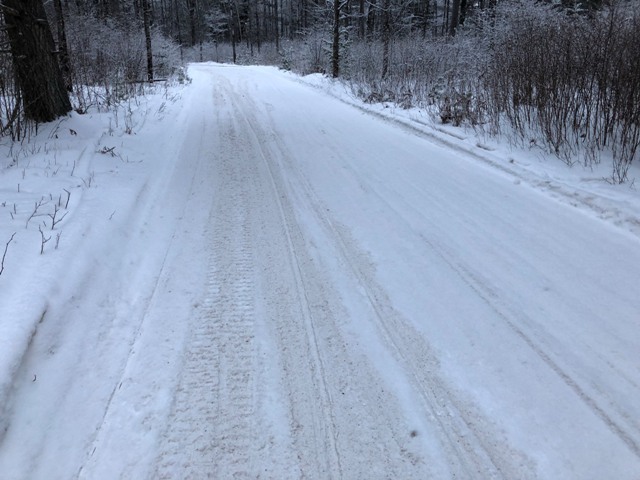 There is some snirt out there in areas while other trails are mostly to all white. The carbides will scrape in spots – mainly on the insides of corners. I did ride some beautiful stretches that made me want to ride all day. 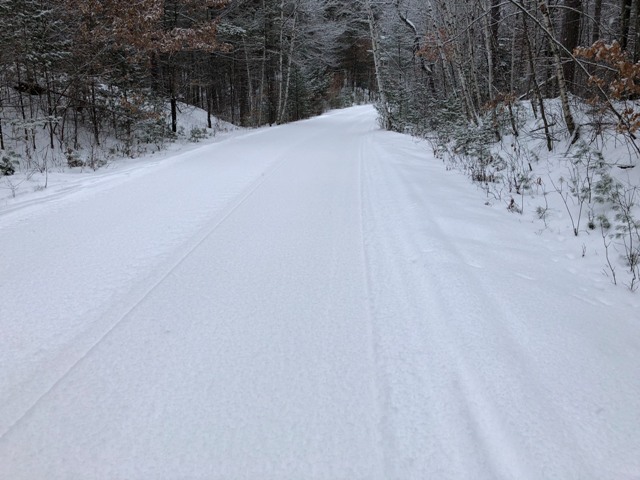 Any snow we get is great and gives the groomers more to work with – just wish the forecasters could be more accurate and not get our hopes up for meaningful snow only to get a little bit.